Welcome to a very mathematical BYOB Party session. 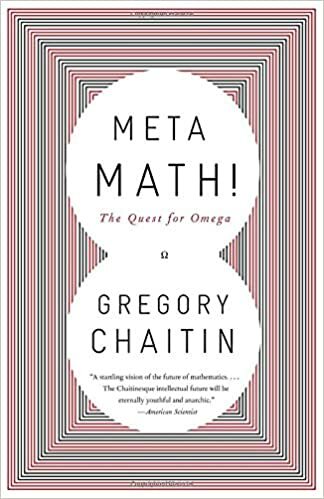 Akshay has been attempting to read a book called Meta Math by Gregory Chaitin, the famous mathematician, for a long time. The book is mathematically dense and deals with the idea of discovery of omega or incompleteness. Akshay thinks the best way to get around this book is to have a notebook and pencil to solve proofs as you read. This slows down the reading process but the book is a goldmine for the mathematically inclined. Akshay found Chaitin’s opinionated statements delightful, particularly his disdain for Newton. This book reminded Pratyush of Roger Penrose’s The Emperor’s Last Mind, a book that addresses different questions but uses a similar path. Penrose talks about physics, cosmology, mathematics and philosophy in an attempt to demystify Artificial Intelligence. Books like these make subjects that are seen as dry, such as math, seem extremely interesting. They strengthen the idea of education as questioning and retaining curiosity. Abhaya mentioned that Logicomix, a graphic novel by Apostolos Doxiadis, humanizes mathematicians and deals with their personal struggles and mental health issues. Another mathematical graphic novel that Akshay mentioned was The thrilling adventures of Lovelace and Babbage by Sydney Padua, winner of the British Book Design and Production Award for Graphic Novels. This graphic novel deals with an alternate version of the collaboration of Ada Lovelace, daughter of Lord Byron, and Charles Babbage, the inventor of the computer. If mathematicians interest you try reading Men of Mathematics by Eric Temple Bell. Mathematicians are famed for their eccentricities and mental health issues more of which are lucidly described in A Madman Dreams of Turing Machines by Janna Levin. More books(unmathematical, I’m afraid) in Part 4.